WoKart was developed using the latest comprehensive digital technologies including CAD/CAE/CNC and FEA which creates a body whose strength exceeds the regulations by many times. The development process has made extensive use of the these technologies to both create proof of concepts as well as detailed engineering layouts. 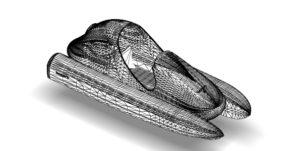 By using the digital platforms it has been possible for the team to produce accurate models capable of designing manufacturing profiles and proving hydrodynamic interactions efficiently. In addition this computer modelling allows for detailed analysis of structures, loads and required strengths to ensure the best balance between strength, performance and weight.